Plot – Story or Grave? I went on a walk this morning, took a turn up past the small cemetery that lies on the coastal town of Schull (West Cork, Ireland). It slopes gently down to the shore, overlooking Schull harbour and the Carbery isles – in turn lying on the edge of the Atlantic. It is a beautiful spot. I find it very moving and inspiring. It set me thinking of plot. Any writer will tell you that every good story has to have a great plot. And while I like to think that ‘K-Girls’, my book, has one, I have to confess that the whole idea behind writing my series starts with a rather basic, very sad looking plot. I discovered it at the age of 12, and was struck by it from the get go. But it would take me the guts of 30 years before I gave it it’s due respect. 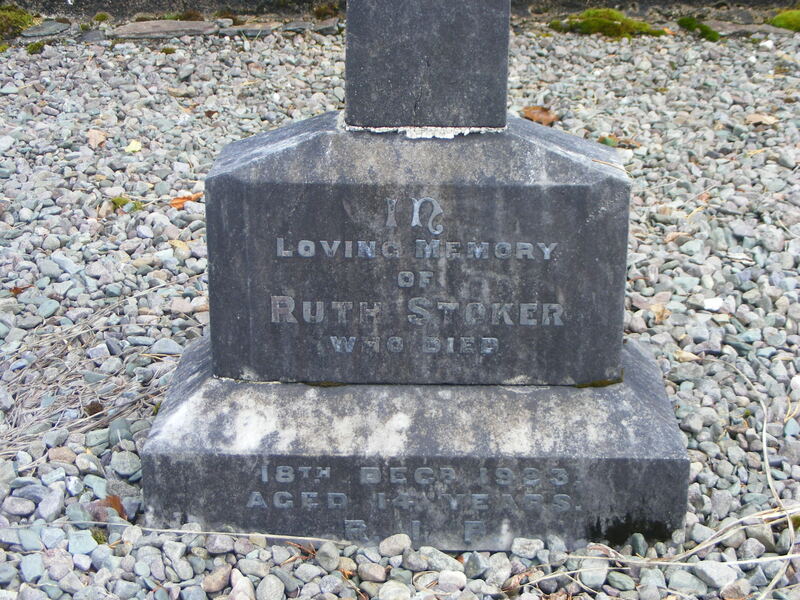 Not many know this, but the whole plot behind K-Girls started with the actual plot, that is the grave, of Ruth Stoker who is a 14 year old who is buried at Kylemore Abbey, Connemara, Co. Galway. For any who have had the pleasure to visit Kylemore, you may remember the lovely walk to the Gothic Church that lies to the east of the Abbey/Castle? I could say a lot about this cathedral in miniature, but I do not want to waiver from the topic that is, Ruth. Anyway, under the shade of the Oak trees and watchful eye of Gothic gargoyles is a simple cemetery where in lies the remains of the Benedictine community that have passed on over the years. When I was a student at Kylemore the myth was that she had died having fallen from the tower (the reason why the Gothic was locked up at the time) , or another, drowned in the lake (explaining why us students were never allowed to swim or boat on the mass of water). I suppose many girls saw the grave and wondered for a moment, perhaps some didn’t see it at all. But it struck a chord with me – why was there a girl buried in the nun’s cemetery? And admittedly, the romantic in me thought how lovely to be buried at Kylemore – imagining that she must have had a great love for the school and her time there. And that one day, as I have a similar love, that I too might be buried there – or at least some ashes scattered. Now that I am 44 and married with my own teen girls, I see a different side – that of the view of a mother – and try and imagine what it must have been like for the mother of Ruth to have to say good bye to her little girl, and then to witness her being lowered into the ground? Did the sun shine, setting the church lime stone alight, or did the Connemara rains fall gently dusting people’s umbrellas, or cloche hats and caps. Was there a good turn out? How many would have been stood around the small ope and scattered soil into the dark earth on that December day? As a student at Kylemore, I did not consider a mother’s love, I was too preoccupied with who Ruth was and where had she come from? How had she truly died? Perhaps that is where the seed of her spirit was captured within me at the age of 12 and she grew as I did over my years at Kylemore and then, unbeknownst to myself – Ruth came away with me. It was only the last 7 years that I built up the courage to start writing in earnest and contacted one of the older nuns (Sr Benedict, historian) about Ruth. While Sr Benedict was not too familiar with Ruth’s background, she went to the retired elders and discovered that Ruth’s story was a foggy one. A fire in the bursar office in the 50’s (that is a story in its own right) destroyed all student records and so little was remembered of her, only that the retired nuns remembered something about ‘galloping consumption’ and being ‘buried in Kylemore at the request of her parents’. Oh! – now that put a different perspective on it – galloping consumption? – buried at the request of her parents? What did that mean? Consumption, I understood was TB but what did galloping? It did not bode well. And Ruth buried at the request of her parents? – Where they there after all? My mind raced with supposing and surmising. And so curiosity took me down a road of research and censuses – all the while, Ruth stood at my shoulder, and I felt as if she was smiling enjoying the mystery that she had become for me. Writers will tell you that characters become alive and when writing, they will so often lead us down a plot path that we never designed in the first instance. I have found this of Ruth. It is nice to see that a other stones have been placed by mine. But the Ruth of K-Girls, the one that lives in my head and manifests as a ghost in my writing, well she is having a ball within the pages that is K-Girls with her new mortal friend, Alice. Ruth is getting to live her teen life all over again – albeit in the 80’s – and as Alice has a whole 6 years to go as a student of Kylemore. and sometimes even losing it every now and then. I think that’s a fascinating little story. Also a great answer to the oft-asked question, “How do you get your ideas?” I look forward to hearing more!